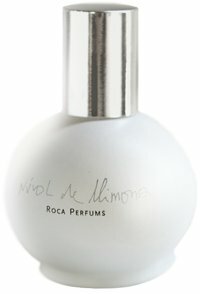 Another round of quickie reviews: Roca Perfums Núvol di Llimona / Lemon Cloud, Especially Escada and Lalique Encre Noire Pour Elle. The opening is truly good enough to eat, and it should be. Núvol di Llimona (or “Lemon Cloud”) was developed by pastry chef Jordi Roca of the renowned Cellar de Can Roca. It's supposed to be a lemon muffin soaked in milk — or "an all-pervading, ethereal cloud of lemon surrounding a sponge cake treated to milk and sweeties", take your pick — and that's just what it is, a sheer lemon sugar fragrance with subtle cake notes, lightly charred, lightly milky, not overly sweet. It's sort of like a foodier version of Fresh Lemon Sugar, and it's highly enjoyable — if I still worked in an office, it's just the sort of thing I'd want to have in my top right desk drawer for a quick dose of comfort and cheer in the late afternoon. Even though I don't work in an office, I'd still like a bottle, and it would be an excellent (if spendy) choice for a very young girl who wanted her own perfume. The notes are bergamot, tangerine, lily of the valley, milk, custard, sugar syrup, toasted sugar and musk. It can be purchased from the restaurant's website (€50 for 50 ml) and is coming soon to Luckyscent in the US. Especially Escada is the latest from German fashion house Escada. It's supposed to be about "the scent of morning dew on a rose", and it's supposed to help you "create your world of happiness". It's probably somebody's idea of happiness, but it isn't mine — this is a very fresh and clean floral with some watery pear and a hint of something vaguely rosewater-ish. In no time at all, it dries down to a basic pink 'n fruity laundry musk. To an old-school perfumista like me, it smells more like a hygiene product than a perfume. To anyone afraid that rose might be too old-fashioned to wear, it's probably perfect. 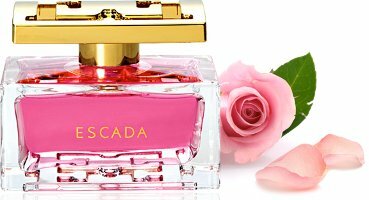 Especially Escada is available in 30, 50 and 75 ml Eau de Parfum and in matching body products; notes feature ambrette, pear, rose, ylang ylang, aquatic accord and musk. This was Lalique's 2009 feminine follow-up to the 2006 masculine Encre Noire, and I took my own sweet time getting around to trying it. That's partially because I adored the original (dark and dirty) Encre Noire and didn't figure they could best it, and partially because it didn't get particularly glowing reviews. But I've always wondered about it — it was developed by perfumer Christine Nagel and the notes (bergamot, vetiver, musk, kephalis, freesia, rose, osmanthus, cedar and ambrette seed) sounded great. I'm sorry to report that I'm on the side of everyone who found it dull. It's a bland, thin, sort-of-rose-ish floral over a clean and pale woody musk base, with the vetiver mostly missing in action. I wore it for a couple days next to Especially Escada, and it's hard to say which one I enjoyed less. The Escada isn't my sort of thing, but at least it's cheerful. The Lalique mostly just sits there, afraid to say or do anything at all. 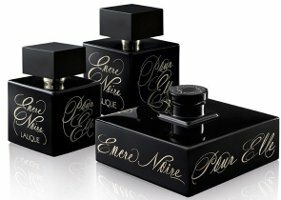 Lalique Encre Noire pour Elle is available in 50 and 100 ml Eau de Parfum. There was also a limited edition Parfum (see the lovely squat ink bottle above lower right), very expensive and perhaps much better than the Eau de Parfum, but I assume that's long sold out. love these short ‘n’ to the point reviews! thanks, and would love more, please, from all the NST contributors! Second that. These mini-reviews are perfect little amuse-bouches. I agree that it’s nice to get the gist of a scent so readily! I suspect, though, that they suit the simple fragrances best. . .not sure I’d want to miss the stories and free-associations that come with a complex fragrance review told by a skilled reviewer! I do also worry that they’re less helpful to newbies? Less background info, more of what I think of as “perfumista shorthand”. It’s true that I often miss references to past scents. . .if a review is a comparison of a classic to a new scent, I can’t quite “smell” it in my mind, but I don’t mind! It usually just means that I have to add yet another scent to my to-sniff list. Lemon Cloud was an unsniffed purchase, and I was actually surprised by how much less foody it was than I was expecting. It’s all bergamot, tangerine and lily of the valley on me, with very little “cake.” If I smelled it without knowing the notes, I don’t think I would ever catagorize it as a gourmand. I’ve been enjoying it quite a bit, and my toddler always asks for a spray because she likes it too. It also has pretty decent lasting power for a cheerful citrusy fragrance. You were brave to buy unsniffed! I would agree, very little cake (maybe my “subtle” above wasn’t put strongly enough). Lemon Cloud sounds lovely but I think I would want more if the cake-y custard note..cause that sounds just so yummy to me! Now I am in the mood for a gourmand..too bad I don’t have much of those to choose from in my collection as of yet. There must be a cakier lemon fragrance, but offhand can’t think of it. I got a free sample of the Escada, and while I got considerably more rose from it than you did, I concur wholeheartedly on the hygiene product comparison. I’m a rose ho, but this very fresh type rose is not one I like at all. Perhaps the young ‘uns will like this one, but I’d rather have Granny’s old-fashioned powdery rose, myself. Oh, I hate those little towelette thingies! But they did make carded glass vials, so wonder why you got that. Oh, that LE perfume bottle is just PERFECT – I can hear my credit cards are heaving sighs of relief that it’s already gone. As a former Love’s Lemon addict I’m feeling the tug of Lemon Cloud. We sprayed that stuff everywhere! Dying to try Lemon Cloud! Thanks for these reviews, Robin! It’s a simple little thing, but fun. I own the men’s but it’s one of those that I forget to pull out — was fun wearing it this past week. Lemon Cloud sounds like fun! Thanks for all these short-but-sweets. Lemon Cloud sounds wonderful. . . until i got to the musk. Lucky Scent just started carrying it, but no. No musk and lemon. If I want the scent of a lemon dessert smushed in an armpit, I can do it in the privacy of my own house. Why would you ruin a lemon and milk scent with musk? If you have to have a base note, use tonka, sandlewood, or a plate, if it’s a foody scent. But most fragrances have one or more “musk” aromachemicals, whether they list them in the notes or not.